Operators are no longer very far from covering 99% of the French population in 4G, except Free Mobile, in the background with a coverage of 92% in November. To catch up, and because the roaming with Orange has further diminished at the beginning of the year, Free is working hard on the 700 MHz, a band of frequencies that has the advantage of carrying beyond the others, which makes it possible to cover the territory more quickly. In December, Free Mobile put into operation 259 additional 700 MHz antennas, for a total of 3,252. Bouygues Telecom, which is the only other to exploit 700 MHz for the moment (Orange has just started), is far behind with 655 antennas in service. As a reminder, the 700 MHz were previously used for DTT. The frequencies have been progressively transferred to operators since 2016. The transfer will be completed this year. 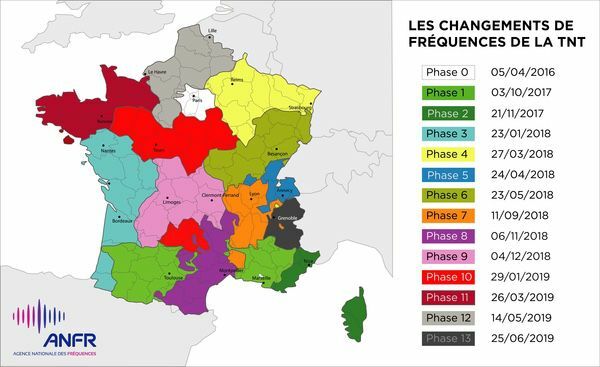 Schedule of the transfer of the 700 MHz to the operators according to the regions. In addition, the proceedings begin for 5G. Eight new experimental stations were authorized by the ANFR in January in the 3.5 GHz band, for a total of 57 licensed stations.